After accepting your prospects, you still have full flexibility with what happens next. You can pause the campaign, reschedule next email, transfer prospects to another campaign and much more. Go to Campaigns and select one of your campaigns to see your list of prospects. Right there you can manage prospects one-by-one or work on groups. To select a group of prospects you can simply mark boxes next to their names or you click on the box at the top of the list. Choose all featured prospects or define the number and hit Confirm. NOTE: Bear in mind that you can also choose the first prospect and holding Shift select the last one - this way all the prospects between the first and the last selected will be marked as selected as well. 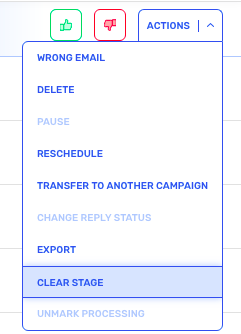 If you want to pause a running campaign, go to Actions and select Pause. No new messages will be sent to selected prospects until you decide otherwise. NOTE: Remember that this action can be applied only to prospects with statuses Scheduled and Contacted, so if you’re planning to pause the campaign for more than one prospect, it’s a good idea to filter out only these two statuses. If you want to reschedule the campaign for a specific day, go to Actions and select Reschedule. Select the desired day of sending the next email in the calendar or choose an option to send messages immediately and confirm. If you decide that the selected prospect should belong in another campaign, you can transfer them pretty easily. Go to Actions and select Transfer to another campaign. Choose one of your existing campaigns from the list or create a new one. If you decide to use one of your previous campaigns, remember that the sequence used in this cadence will be scheduled to your prospect. Next, accept prospect and schedule the campaign. For the new campaign, you need to select the sequence, accept the prospect and schedule your campaign. Along the way, you can even generate more prospects and add them to this campaign. We prepared a separate article where you can read all about transferring prospects. You can delete any prospect accepted on your account. Go to Actions and select Delete. Note that when you delete prospects, they can be generated or imported in the future and all history of your outreach will be deleted. If you notice that the email address of your prospects doesn’t exist or that someone stopped working in the company, you can mark them as Wrong email. Go to Actions and select Wrong email. Thanks to that you’ll keep track of all the companies that you contacted and the ones that you can find more people you can reach out to. To help you keep track of the success of your campaigns we prepared two buttons: green thumbs up to qualify prospects and red thumbs down to unqualify them. After clicking on thumbs up or thumbs down you can decide if you want to mark only this prospect or the entire company. If you select to qualify/unqualify only the prospect, we will change their status and pause the current sequence. If you select the entire company, we will change the status of all prospects from this company on your account and we’ll pause sequences to all of them. You can use it to mark all prospects that became your customers or positively replied to your campaign as qualified to note this success. To help you track the overall success, each campaign has the Qualified rate in its summary. Of course, sometimes you may get negative replies. That’s when unqualifying may be useful. Mark all prospects who weren’t interested in receiving any other campaigns or companies that don’t need your product.